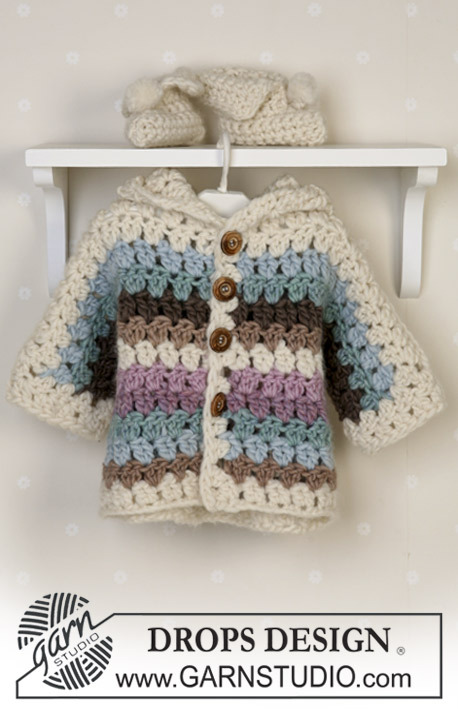 Go to original pattern for design DROPS Baby 14-25. Stripes: See diagram M.1. 1 row in diagram = 1 row of tr’s. Crochet info 1: At the beginning of each row of tr’s replace the 1st tr with 3 ch, and finish each row with 1 tr in 3rd ch from beginning of previous row. 2nd row: 3 ch (= 1 tr), 2 tr between the first 2 tr-groups from previous row (crochet at top of st and not round the whole st), *2 tr between the next 2 tr-groups*, repeat from *-* and finish with 2 tr at the top of the last tr = 1 tr (3 ch) + 10-11-13 (14-15) tr-groups on row – see Crochet info 2. When piece measures approx 20-23-23 (27-30) cm inc for sleeves each side as follows: Cut the yarn. Crochet 16-19-19 (25-28) ch, crochet as before over the back piece, at the end of row crochet 16-19-19 (25-28) ch. Turn the piece and crochet as explained for 1st row so that the pattern continues as before = 1 tr (3 ch) + 20-23-25 (30-33) tr-groups on row. When piece measures 30-33-36 (40-45) cm cut the thread. Left front piece: Crochet 16-16-19 (22-22) ch (incl 3 ch to turn with) using Eskimo 01 and crochet hook size 9 mm. Crochet stripes after M.1 and tr-groups as described for back piee = 1 tr (3 ch) +5-5-6 (7-7) tr groups after 2nd row. When piece measures approx 20-23-23 (27-30) cm inc for sleeve at side as described for back piece. Continue pattern as before = 1 tr (3 ch) + 10-11-12 (15-16) tr-groups on row. When piece measures 30-33-36 (40-45) cm cut the thread. 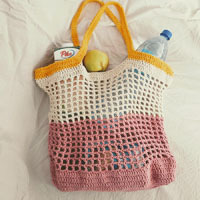 Right front piece: Crochet as left front piece, but mirrored. 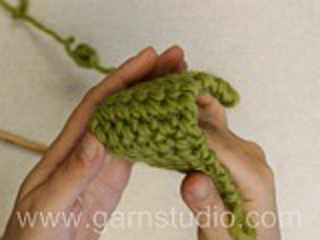 Cuffs: Crochet 2 rows of tr along sleeve edge using Eskimo 01 = approx 1 tr (3 ch) + 8-8-10 (10-11) tr on row. Front edge: Crochet 1 row of tr-groups along the front edge of both front pieces using Eskimo 01 = approx 12-13-14 (16-18) tr-groups. Assembly: Sew shoulder/sleeve seams – start at sleeve edge and work towards neckline – leave 5-5 tr-groups mid back for neck opening. Sew underarm and side seams. Hood: Use Eskimo 01. 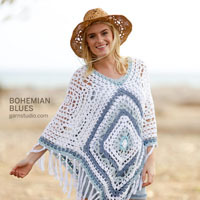 Crochet 1 dc in 1st st, 3 ch, approx 13-14-15 (16-17) tr-groups round neckline as described for jacket. Continue with tr-groups until hood measures approx 22-24-26 (29-30) cm, cut the thread. Fold hood double and sew top seam with neat sts. Sew on buttons on left front piece – the top one approx 1-2 cm from neckline and the bottom one approx 10-12 cm from lower edge. 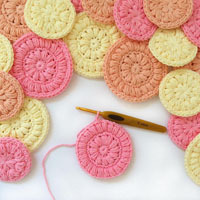 Crochet Gauge: Width of 10 dc and 11 rows using crochet hook size 7 mm = 10 x 10 cm. 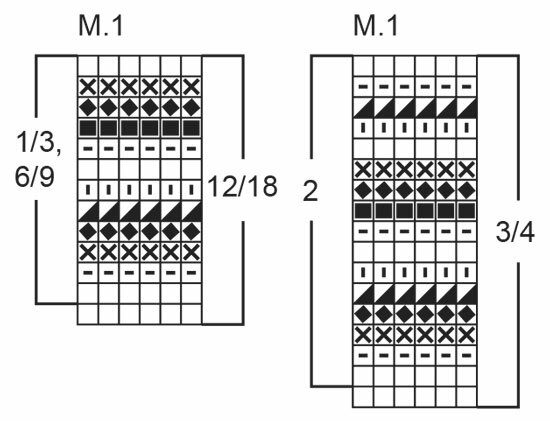 Crochet info 1: At the beginning of each row of dc’s replace the 1st dc with 1 ch, and finish each row with 1 dc in ch from beginning of previous row. Crochet the bootie in one piece and sew seams mid front and mid back. 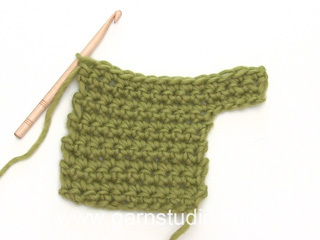 Crochet 7-8-9 (10-11) ch (incl 1 ch to turn with) using crochet hook size 7 mm and Eskimo 01. 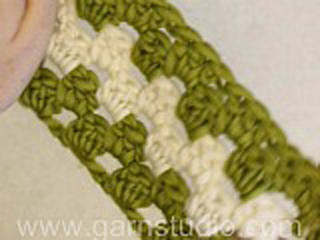 Crochet rows – read Crochet Info 1 – start in 2nd ch from hook. = 7-8-9 (10-11) dc on row. 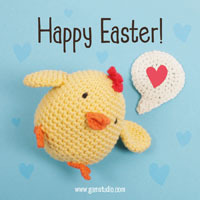 When piece measures 7-8-9 (10-10) cm inc at one side for foot by crocheting 3-3-3 (404) new ch and continue with dc in all sts = 10-11-12 (14-15) dc. When piece measures 15-18-21 (24-26) cm cast off the 3-3-3 (4-4) foot sts by turning the piece just before these sts. Continue with dc over the remaining 7-8-9 (10-11) dc until piece measures 22-26-30 (34-36) cm. Assembly: Fold bootie double and sew seam mid back and mid front with neat sts – leave an opening of approx 5-6-7 (8-8) cm at the top mid front. Crochet the other bootie. 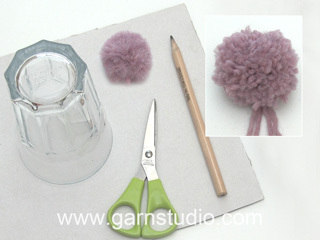 Pompon: Make 2 small pompons with a diameter of approx 3 cm and attach to top of each bootie. Hood: Use Eskimo 01. Crochet 1 dc in 1st st, 3 ch, approx 13-14-15 (16-17) tr-groups round neckline as described for jacket.